The top of the Wusthof range - a beautiful 9 piece knife set with Choco Beechwood handles. The jewel of the Wusthof collection the Wusthof Ikon range is recognised by its dark brown hues with distinctive wood grain markings that make each knife unique. Forged from one piece of specially tempered high carbon steel to ensure outstanding strength it has an extraordinary sharpness which is easy to maintain. Triple riveted handle, with a full tang it has been ergonomically developed in consultation with professional chefs. Perfectly balanced, exceptionally sharp and having a seamless, hygenic handle this knife is an extension of your hand. For slicing, mincing and dicing of all kinds of food. All knife measurements are for the blade only, not the handle. Knife block: Length 29cm, wide 15cm, height 24cm, made of select beechwood. Not dishwasher safe, wash by hand only. The IKON knife handles are manufactured from Choco Beechwood. As a result of its extreme density, minimal porosity and high resin content, this wood species is high insensitive to moisture. Save R2660 when buying the set compared to the individual items. 1 in stock, can ship immediately. More available from supplier, ships from us in 16 to 22 days. View more from Knife Sets, Wusthof Ikon. Let's be perfectly realistic for a second here. Nobody needs this knife set. You can get away with one decent chef's knife. If you cook a whole lot, you can add a smaller paring knife and be happy for the rest of your life. If you eat a lot of bread, add a bread knife and you'll be set. So need doesn't enter into this equation. No my friends, this purchase is likely to be driven by lust. r /> This is one pretty set of knives. The wooden knife block alone is pretty spectacular. I watched a video of Gordon Ramsey preparing something and spotted this same block in his kitchen. I mean, if it's good enough for Gordon, right? Now let's talk about the knives. I've had this set for a little while and so far I've used the chef's knife more than any other. 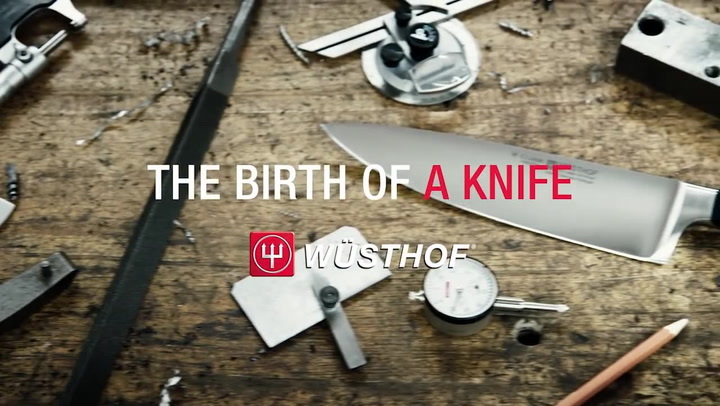 Obviously, because a chef's knife is the most versatile knife you can own. It does pretty much everything. Mainly I've been using it to chop nuts and herbs. Right out of the box, this thing is so sharp, the nuts didn't even know they were being chopped. It was like chopping candyfloss. What a dream. I've had this set for long enough now that I'm over the excitement, so I'm back to chopping nuts in the food processor, but for a while there, I was looking for excuses to use this knife (my dedication died shortly after I chopped 1kg of fresh ginger by hand and realised I was being stupid, the food processor is there for a reason). I will, however, be purchasing a larger chef's knife in the near future, because sometimes you just need a really big knife, you know? This knife is probably not going to be ideal for someone with very large hands. I would describe my hands as medium sized, for a woman. Next, the Santoku knife. Sharp and slightly scary to use. Unlike Western style knives (like the chef's knife), the Japanese Santoku knife is used in a rapid up and down chopping motion, not a rocking motion. Although I find it a little bit intimidating, I have chopped onions with this knife and it sliced through them beautifully. This knife is best for cutting up vegetables. The sausage knife is another surprise. This was the first knife I used and I cut myself on it during the first wash. I was using a sponge to wipe the flat of the blade and suddenly there was no more sponge and instead I was slicing through my finger. Ouch! Don't do that. Now I wash these knives using a long-handled plastic brush, from a distance! It works a treat and I feel much safer. (Upon hearing my tale of woe, everyone is always quick to instruct me on how to wash a knife. I know how to wash a knife. Really, this one was just ridiculously sharp, but now I know and I won't make the same mistake twice.) The serrated knife makes quick work of salami and even flaky pastries. I haven't sliced a tomato yet, but when I need to, I will use this knife. The bread knife is pretty standard, sharp, but not long enough to slice large round breads easily. I will be purchasing an additional longer bread knife. However, a longer knife would stick out of the block like a sore thumb, so it makes sense that this one is 20cm. And to be fair, I haven't had to slice any breads that are too large for this knife. You can't sharpen this knife effectively, due to the serrated edge. I haven't had the opportunity to use the carving knife and fork on a large roast yet, but the fork is the most solid one I have ever seen. No chance of these tines bending. The carving knife, again, is shorter than I might have liked, but I am sure it will do a fine job on small and medium roasts. The paring knife hasn't seen much use in my kitchen. It's a small 9cm knife, used for delicate cuts, but so far I've been able to use the chef's knife or Santoku for all my vegetable cutting needs. I do own several Wüsthof paring knives (from the entry-level Silverpoint range) and have been more than happy with their performance, so I can't imagine that I will be disappointed in this paring knife. I have not used the scary looking peeling knife at all. Boy, does this thing look dangerous! It's sharp enough to use during delicate brain surgeries, I'm sure. Since I'm on the banting diet, however, I haven't had cause to peel apples or anything else, so I just haul out this knife to frighten my guests when I show off my knives. You look like a bit of a gangster wielding this one. For interest's sake, this knife is also known as a "turning knife" and is used in French cooking to create 7-sided football shaped "turned" vegetables. Ain't nobody got time for that, except maybe chefs in training. The honing steel is used before each use of the knife. It is not intended to sharpen your knives. It is used to straighten the edge before cutting. If you picture the V-shaped edge of the knife, through use and sometimes just because of the metal's characteristics, the edge will curl over to one side ever so slightly. Using the honing steel straightens it out again before you use it. The easiest way to use the honing steel is to place it on a counter (rest it on a damp cloth or silicone trivet to prevent slipping) and then gently slide the knife edge down from top to bottom, holding the knife at a 20° angle. No need to press hard at all. Repeat on both sides of the blade 4 or 5 times. That's it. By now you've probably realised that owning a knife set of this quality is not going to be maintenance free. You want to protect your equipment and keep it in good working order. If you don't have solid knife skills, better learn those fast. Read up on the claw and pinch grip and practice them from now on. Next, maintain your knives. First order of business is to purchase and use an end grain chopping block. This is a wooden board that looks like it is made from small little blocks of wood, looking down, you can see the rings of the tree. Edge grain chopping boards look like they are made out of long planks. End grain boards (the little blocks) are easier on your blades and last longer than edge grain boards. You're going to need to oil it regularly and sand it down once it gets scratched and cut. Next up, get a bench scraper/dough scraper. This is to scrape up all the chopped food, instead of using the edge of your knife. You really don't want to take that sharp knife and scrape it around on your board, do you? If you're broke from buying the knives, at least use the back of your knife to scrape, not the sharp edge. We're not done yet. You're going to need to keep these blades sharp. To do that, you'll need to purchase a whetstone and learn how to use it. Please don't use those "automatic" or pull-through sharpeners for your decent knives. If you don't want to learn how to use a whetstone, rather buy inexpensive or at least less expensive knives. Either that, or be willing to watch your knife edges deteriorate with use and wear away in your pull-through sharpener. The Wüsthof whetstone (medium and fine) is great. You soak it in water, sharpen your knives (this takes 20-40 minutes per knife) and you're good to go for the next six months or so (unless you use your knives three times a day, every day, then you're looking at sharpening every 2 months). Watch some videos to learn how to use a whetstone, it's really very easy. My final tip is to read the book "An Edge in the Kitchen", which will tell you exactly what you need to know about selecting and maintaining your kitchen knives.